Purpose: To provide a step-by-step guide to creating a profile for a non-Federal Traveler (aka Invitational, Guest, Patient Traveler) who is traveling on behalf of the Federal government. This function can only be performed for those with PAT tool access. For an emergency, Invitational Traveler (will travel within 3 business days), the Lead Federal Agency Travel Administrator (FATA) (or designee) may enter the profile directly into ConcurGov, populating only the required fields. See Module 5: User Profiles in the FATA Training Manual for this process. This will enable the Travel Management Center (TMC) to create a Travel Reservation for this Traveler. Contact the TMC directly to book and ticket the reservation. Verbal approval is required. The form must still be submitted to the Program Support Center (PSC) Transportation Services Account Manager with a note stating that a manually created profile already exists. The full profile will then be created by PSC Transportation Services, and the FATA will be notified. An Authorization and Voucher can only be successfully created and submitted after PSC Transportation Services has completed the profile. Locate the PAT through the following link: https://patpsc.hhs.gov/ Select the “Login” button to begin. Note: If you are using Internet Explorer and the PAT does not appear as in the screenshot to the right, it may not be included as a trusted site in your internet options. To correct this, contact your IT help desk. 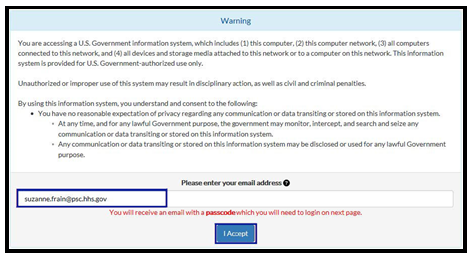 Read the content in the “Warning” section and then enter your email address to begin the login process. Select the “I Accept” button to proceed. This will create a passcode for this session. Note: To ensure security, a new passcode is required for each session. Go to your email account to retrieve the new passcode. Enter the password that you received from your PSC Account Manager when your PAT profile was created. Then, enter the Passcode that you received in your email per Step 3 and select the “Sign In” button. Note: If you have forgotten your password, you can request a temporary one by selecting the Reset Password button. See steps 12-16 for this process. 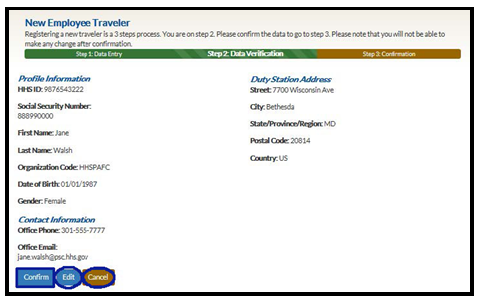 Begin entering a new ConcurGov profile by selecting either the “Enter New Employee Traveler” button or the “Enter New Invitational Traveler” button. 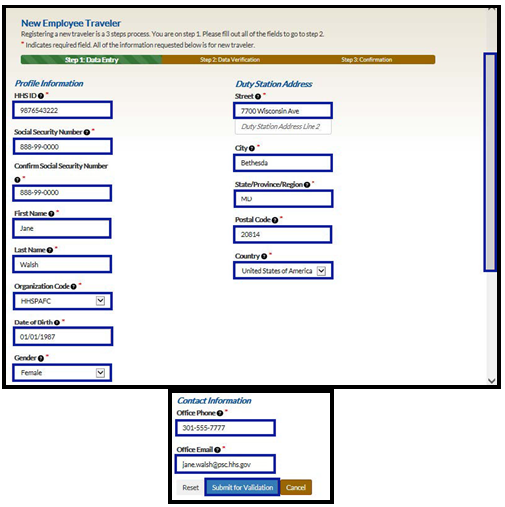 Enter all of the profile information in the “New Employee Traveler” page including the HHS ID (PIV card number), social security number, name, organization, date of birth, gender, and duty station address. Select the scroll bar to continue. Note: The New Invitational Traveler profile will require a Host HHS ID instead of the employee’s ID. All other fields are identical. Enter the office phone and email address for the Traveler. Then select the “Submit for Validation” button. Note: An error message will occur if the HHS ID already exists in ConcurGov. Confirm that the information you entered for this Traveler is correct. Use the “Edit” button to make changes or the “Cancel” button to cancel this request. If the information is correct, select the “Confirm” button. A confirmation message will appear indicating that the profile has been submitted to ConcurGov. Select the “Profile Start” button to add another ConcurGov profile. Select the “My PAT Profile” button to update your profile. 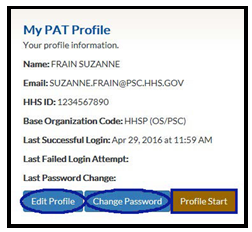 Use the “Edit Profile” button to change the name or email address on your PAT profile. Select the “Change Password” button to update your password at any time. Select the “Profile Start” button to begin adding another ConcurGov profile. Select the “Sign Out” button to sign out of the PAT. To reset your password, select the “Reset Password” button on the Sign In page. Enter the Passcode that you received in your email per Step 3. 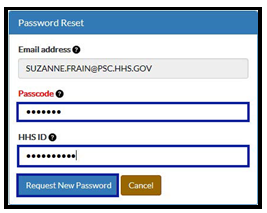 Then enter your HHS ID (PIV card) number and select the “Request New Password” button. A temporary password will be sent to your email address. Enter the temporary password that was sent to your email address. Enter the Passcode that you received in your email per Step 3. Then select the “Sign In” button. If your do not receive your temporary password, select the “Reset Password” button again. If you require a new passcode, select the “Request New Passcode” button. Enter the temporary password in the “Current Password” field. Enter a new password following the password rules listed on the page. Then select the “Change Password” button to complete.